Cut 6 of the 8 tomatoes into small pieces and add celery, sugar and ½ teaspoon salt. Allow tomatoes to simmer for 30 minutes or until they are soft and juicy. Strain and push tomato pulp through a fine sieve. This should yield 3 cups of juice. Allow juice to cool completely in refrigerator. Chop cucumbers, remaining yellow tomatoes, peppers and onions in a food processor, but do not let them become pureed. Combine chopped vegetables in a large bowl and add olive oil, garlic, salt and pepper. 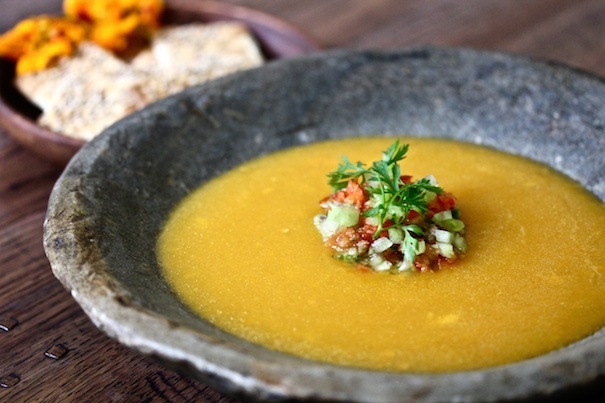 For the brightest yellow gazpacho, mound the chopped vegetables into a bowl and pour the chilled tomato juice around them, and serve – or combine all ingredients and stir until well mixed. This will yield a chunkier, more colorful version of the gazpacho.